Combine the China grass in 1 teacup of cold water and stir on a slow flame until it get dissolves completely. When the China grass is completely dissolved, put the boiling milk and boil for a further 2 minutes. Strain the mixture and cool to a lukewarm stage. Beat the cream. Put the beaten cream and the vanilla essence and stir well. Pour into wet fancy moulds and allow it to set in the freezer compartment of a refrigerator. Chill completely. Just before serving, loosen the sides with a sharp knife. Serve ice-cold with strawberry sauce. Combine the cornflour and sugar in 1 teacup of water. Allow it to cook and keep on stirring until the sauce is thick and clear. Remove from the fire. 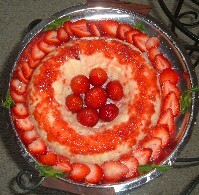 Put the strawberry puree, butter and lemon juice and mix well. Allow the sauce to chill. Chicago Mob Wife Nora Schweihs: Did Her Father Bump Off Marilyn Monroe?